Join us at Once A Month Meals to watch & learn how to prepare easy Dump and Go Keto meals for the freezer! 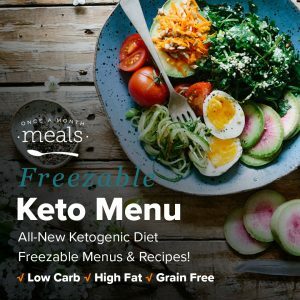 Check out our Summer Keto Freezer Menu Vol. 3 that includes 15 easy Keto freezer meals that double to 30 dinners! Watch as we prepare a portion of these meals on camera! Let us help and encourage you to never cheat again on your health goals and stick to them using this pre-made Keto menu! The end of summer never tasted so good with Bruschetta Chicken Bake and Lemon Basil Grilled Pork Chops as your keto-friendly meal!